What is antibacterial mouthwash & how does it work? Throughout the day, our mouths produce bacteria, both bad and good, and antibacterial mouthwash is designed to reduce or kill that bacteria. Which, is a good thing, right? 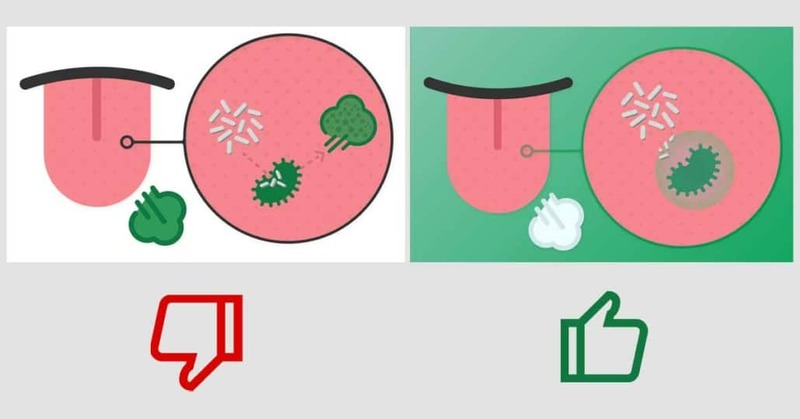 The bad bacteria in our mouths is only part of the reason for bad breath. It’s actually the volatile sulfur compounds, or VSC, that comes from the bacteria that are actually to blame. Antibacterial mouthwash claims to destroy this sulfur-producing bacteria and freshen breath. But, does it? How effective is antibacterial mouthwash? For the most part, it is true that antibacterial mouthwash will kill bacteria. However, that’s not actually a good thing. Some mouthwashes cause an imbalance to oral microbiome, which our bodies use to decrease cavities, gingivitis, and bad breath (Yes. Some mouthwashes can actually lead to having bad breath!). Because of high alcohol content, some mouthwashes dry out your mouth and can cause the skin inside your mouth to become “swampy” which can lead to halitosis. Most mouthwashes simply work as masking agents. They may work for a few moments, but soon that sulfur-like smell, and the bacteria returns. Yeah, it’s pretty disappointing stuff. Fortunately, there are some good mouthwashes out there. In order to truly get rid of bad breath, you need to use a mouthwash that prevents VSCs from developing. SmartMouth Oral Rinse is the only activated mouthwash that uses zinc ion technology and prevents bacteria from producing sulfur gas compounds. With each use of SmartMouth, bad breath will not return for 12 hours. And, if bad breath or gingivitis is a more serious problem, we also offer SmartMouth Clinical DDS Activated Mouthwash. This patented solution promotes optimal oral health and 24-hour bad breath protection by combining the zinc ion technology with anti-plaque and anti-gingivitis benefits. So, next time consider walking by the anti-bacterial stuff and head straight for the mouthwash that will actually do its job.